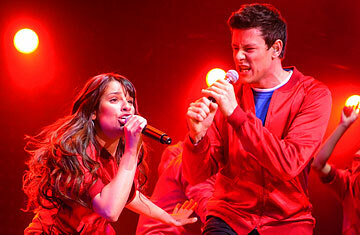 Glee on Stage: Even Better than on TV? Glee, I sometimes feel, is the old cadre's ultimate revenge on the younger generation: a hit TV show about a high school where the coolest kids love Broadway show tunes. The theory is bolstered by the first few minutes of the Glee stage show, just now concluding a four-city tour with a weekend at Radio City Music Hall in New York City. The show opens with Lea Michele, who plays bossy diva Rachel, sashaying down the aisle belting out Streisand's "Don't Rain on My Parade." And 6,000 14-year-old girls go wild. I exaggerate a little. They're not all 14-year-old girls. (I was there, for one.) But even the non-Gleeks in the crowd (well, that would include me as well) can share the excitement. The Glee stage show is a lot of fun. It's little more than a concert highlight reel of musical numbers from the past season, featuring the entire cast, backed by rock-arena pyrotechnics, but none of the sometimes cloying storylines. There's a Madonna number and a Lady Gaga number. Kevin McHale, as wheelchair-bound Arty, sings "Dancing With Myself," and Chris Colfer, as gay icon Kurt, teams with Michele on "Defying Gravity." We get a singalong to Neil Diamond's "Sweet Caroline," trampoline choreography to Van Halen's "Jump" and a load of upbeat pop anthems like "Don't Stop Believin'" and "True Colors." The show's two warring teachers, Matthew Morrison as the Glee Club's mentor and Jane Lynch as his Glee-hating nemesis, are present mostly on video  and then, near the end, in a brief onstage appearance that gets the loudest cheers of the evening. "Why are you still here?" demands Lynch, who had some of her cheerleaders pass out barf bags in the audience beforehand. In fact, Glee may actually play better onstage than it does on TV. For one thing, there's none of the haphazard editing that too often wreaks havoc with the musical numbers on the home screen. For another, the super-amplified sound system muddies the voices just enough that almost everyone sounds at least passable, and in some cases (like Michele's) pretty terrific. Most of all, Glee onstage is a testament to the commercial savvy of what may be the most ingenious marketing engine in the history of television. There's a 20-minute opening act, followed by a 35-minute intermission, giving fans plenty of time to gobble up merchandise in the lobby that includes a $20 souvenir program that doesn't even tell you who directed the show. Whoever it was  good job. See the top 10 plays and musicals of 2009. To read this article in its entirety, pick up a copy of TIME magazine at your local newsstand or download the TIME iPad app. Or, to have TIME magazine delivered to your door every week, subscribe. Print subscribers to the U.S. edition of TIME can access the iPad edition FREE for the length of their current print subscription term.